Princess Grace lived in a castle at the bottom of a tall mountain. Her father was King of Ardonlee and her mother was Queen. Princess Grace had an older brother, Prince Arthur. Sometimes Prince Arthur was quite mean to Princess Grace. He teased her a lot, pulled her hair and ate her sweet when the king and queen weren't looking. One morning, after Princess Grace had finished her royal breakfast, she went for a walk up the mountainside. There were a lot of trees and flowers and rocks. She found a place to sit and looked down at the castle. A noise rumbled in the trees behind her. “Who is there? What was that noise?” She stood and searched behind the rocks and bushes. “My name is Rose.” A loud voice hissed. “I've lived here since I hatched. My mother flew off a year ago to find food and never returned. I've stayed hidden most of the time. The only time I leave the cave is to find something to eat,” Rose said. “To eat? You don't eat people, do you?” Princess Grace stepped back in fear. “No. I eat lizards and mice, berries and nuts, or whatever I can find. I love to eat corn on the cob. It's my favorite.” The dragon's tongue darted out her mouth and she licked Princess Grace. 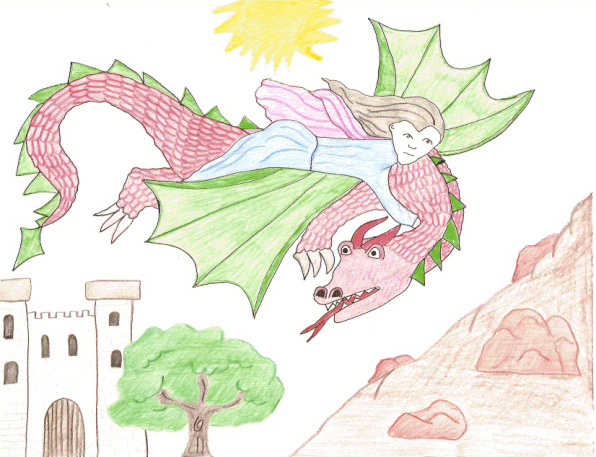 “I'd love that.” Princess Grace climbed on the dragon's back. Rose jumped into the air, spreading her wings to the side. They flew over the castle and up the mountainside and through the forest and above the river. “Yes. I'm lonely up here.” The dragon pouted. “I have a better idea. Why don't you come to the castle and you can live with us. You can be the royal dragon.” Princess Grace's eyes sparkled with excitement. “Can I? Will the king and queen let me?” Rose nodded so the princess could stroke her. “Of course. I'm a princess. They let me have whatever I want.” So Princess Grace took Rose back to the castle and much to her delight, her mother and father let her keep the dragon. When Prince Arthur tried to tease his sister, the dragon snarled at him and blew puffs of smoke. He stopped right away and never teased her again. Rose smiled and flew off towards the sunset.